​Who got into ​Sean Davis' cornflakes? The Steelers offense is making plenty of headlines Thursday night, so perhaps the ​defense wanted to get involved. Here's Davis poking the bear not once but twice, smacking around enormous guard Trai Turner. ​​Love Turner's signal to the ref, too. A true, "You seeing this? Because you should be." The Panthers would be posting an impressive first half if only their defense had shown up in any way. 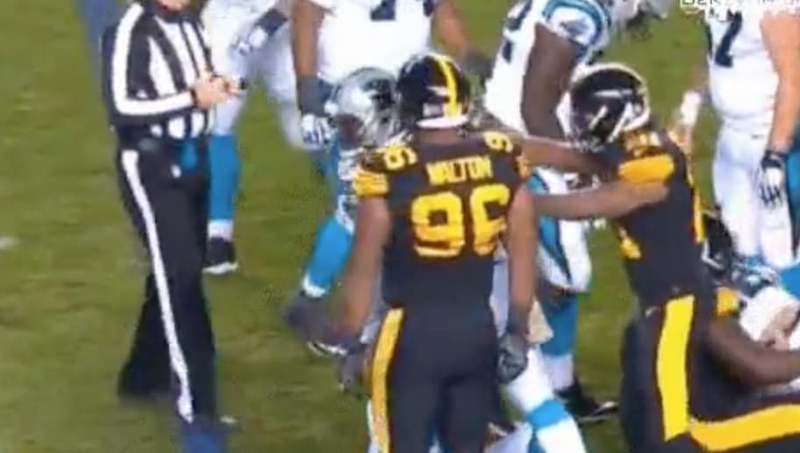 Two TDs to Christian McCaffrey (offset by one Cam Newton failure for a pick-six) would have made this a tight game if the Steelers offense hadn't absolutely lit up their vaunted D.
Only thing that would've been more embarrassing is a swarm of players in black jerseys descending on Turner and engulfing him en masse. Glad there wasn't some sort of weird brawl getting in the way of all the spectacular offense here.